Congratulations to Eileen Mornington for winning the Create-a-Coat Contest! Eileen Mornington will be receiving L$5,000 in-world, as well as an “8 for 4 Weeks Kibbles”, an Eternal Pet Crystal, and a Frankenfen LE Den with a few random traits on it. We also had 7 Runner Ups! (You’ll see why we did 7 in a moment, normally we just do 3). In no particular order: ElieraYamaneko Resident - Mishral Amaterasu – Kristen Mynx – dreamloverforyou Resident – BeeQueen Smythe – DieitraWolf Resident – krystajcf2u Resident – are all winners of L$500/ea, “4 for 4 Weeks Kibbles” as well as an Eternal Pet Crystal! Five of the runner ups all submitted something having to do with a black base coat fen skeleton. Since there were so many of them we couldn’t help but make them all runner ups – mainly because it’s a great idea and one we MAY come out with in the future. We’ll just have to wait and see. We also had a bunch of other entrants who won’t go away empty handed. We’re sending out Eternal Pet Crystals to each and every person who submitted this time around, as per usual. Thanks everyone for participating it was really enjoyable seeing these great ideas. It helps us know where we should steer the ship on this Fennux voyage. NOTE: If you haven’t received your Fennux Eternal Pet Crystal AND it’s after 1:00 AM SLT (On October 1st), send us a Support Ticket and we’ll take care of it ASAP. NOTE: THE LE TRILIGHT EYES (ON THE RIGHT) ARE VERY RARE, DO NOT EXPECT TO GET THEM, BUT IF YOU DO GET THEM – CONGRATULATIONS! And that’s all there is to it! Enjoy your Frankenfen LE Fennux Den, and your 12 Days of Reserve Food! WHERE DO I GET MY FRANKENFEN LE FENNUX? The Wishing Well exists only on the Fennux Sim. We have 1 setup next to every Crafting Machine, and of course these Wishing Wells are used to turn any 12 Fennux Dens into 1 Frankenfen LE Den (and 12 days of Reserve Food). Yes there is a SMALL CHANCE to get “LE Trilight Eyes”, but the odds are roughly about a 0.5% chance to obtain, so don’t expect to get them! The LE Trilight Eyes can pass onto other coats, so even if you don’t get them from Wishing, you will have opportunities to obtain them in the Secondary Market later. Most Fennux however will have regular eyes from a starter den, very similar to Crafting – the only thing that is “LE” on most Frankenfen LE Fennux is the over-ride of the Fennux Coat. It’s more-or-less exactly like Crafting, except for the fact the coat will not pass. So this is something we have known about for a bit – but decided to let it slide for a while. We felt it was unfair to patch it right away as we wanted everyone who figured it out to be able to take advantage of it. Let me give you an example of what people have been doing in the Wishing Well. Let us pretend that the T8s are starting to show up. Now let us pretend that only Saharan and Western are out on the grid. Now let us pretend to place down 12 T8 dens into the wishing well, half of them are Saharan and half of them are Western. What would have happened up until today is a complete random chance to get ANY region, guaranteed to be T8. Long story short, we don’t feel it is fair to the average breeder as the only people who can obtain the new tiers are people who spam the wishing well with Saharan/Western T8s, when we want the new content to be introduced evenly throughout the community, and it’s not possible for us to do that when people are able to unlock content early. SO, as we start to see T8s - which I don’t know when will happen so don’t ask – we will no longer see content being unlocked in this manner (so long as our wishing well code is working properly, haha). It’s simply not how we wanted to introduce new content to the community. Basically, unless something is live on the grid already – you won’t be able to get it through the Wishing Well. You’ll have to get it through breeding. The only exception to this is Crafting, since sometimes Crafting will happen before breeding (regarding new tier level content). Please give any/all feedback to Daemon via the Support Ticket System on this matter. Thanks. I don’t know about you all, but pretty much everyone at Team Fennux has been using Firestorm Viewer since its inception. And today, September 3rd, 2015, is their 5th Anniversary of creating the Firestorm Viewer! That being said – we’d love to give a warm shout out to the team behind Firestorm that keeps the project alive and thriving. Seriously, you folks are great. In honor of this day we are giving everyone the opportunity to pick up limited edition Firestorm Fennux Holdable and Running Pets. It’s the least we could do since our own team has been making use of your product for so long. We will not announce the winner until around the 1st of October – because that is when we intend to release the coat into the Wishing Well. Yes, the winner’s coat will be available in the Wishing Well as an LE for the entire month of October. SO PLEASE THINK OF IDEAS BASED AROUND “HALLOWEEN”. It does NOT have to be scary/creepy/evil, it can be literally anything related to costumes! DEADLINE: September 21, 2015 – Please do not send anything after this date!!! The September 2015 “Angles” Limited Edition Fennux Coat is here! NOTE: THE LE TRILIGHT EYES ARE VERY RARE, DO NOT EXPECT TO GET THEM, BUT IF YOU DO GET THEM – CONGRATULATIONS! And that’s all there is to it! Enjoy your Angles LE Fennux Den, and your 12 Days of Reserve Food! WHERE DO I GET MY ANGLES LE FENNUX? The Wishing Well exists only on the Fennux Sim. We have 1 setup next to every Crafting Machine, and of course these Wishing Wells are used to turn any 12 Fennux Dens into 1 Angles LE Den (and 12 days of Reserve Food). Most Fennux however will have regular eyes from a starter den, very similar to Crafting – the only thing that is “LE” on most Angles LE Fennux is the over-ride of the Fennux Coat. It’s more-or-less exactly like Crafting, except for the fact the coat will not pass. The August 2015 “Sol” Limited Edition Fennux Coat is here! NOTE: THE LE LUCIDA EYES ARE VERY RARE, DO NOT EXPECT TO GET THEM, BUT IF YOU DO GET THEM – CONGRATULATIONS! And that’s all there is to it! Enjoy your Sol LE Fennux Den, and your 12 Days of Reserve Food! WHERE DO I GET MY SOL LE FENNUX? The Wishing Well exists only on the Fennux Sim. We have 1 setup next to every Crafting Machine, and of course these Wishing Wells are used to turn any 12 Fennux Dens into 1 Sol LE Den (and 12 days of Reserve Food). Yes there is a SMALL CHANCE to get “LE Lucida Eyes”, but the odds are roughly about a 0.5% chance to obtain, so don’t expect to get them! The LE Lucida Eyes can pass onto other coats, so even if you don’t get them from Wishing, you will have opportunities to obtain them in the Secondary Market later. Most Fennux however will have regular eyes from a starter den, very similar to Crafting – the only thing that is “LE” on most Sol LE Fennux is the over-ride of the Fennux Coat. It’s more-or-less exactly like Crafting, except for the fact the coat will not pass. We just updated the Fencyclopedia so it has images on not only the Coats page, but also the Ears, Hairs, Tails, Eyes, Aggressions and Whiskers pages as well. Oh, and we got all of the coats up-to-date again. Check it out! The July 2015 “Glory” Limited Edition Fennux Coat is here! And that’s all there is to it! Enjoy your Glory LE Fennux Den, and your 12 Days of Reserve Food! WHERE DO I GET MY GLORY LE FENNUX? The Wishing Well exists only on the Fennux Sim. We have 1 setup next to every Crafting Machine, and of course these Wishing Wells are used to turn any 12 Fennux Dens into 1 Glory LE Den (and 12 days of Reserve Food). Most Fennux however will have regular eyes from a starter den, very similar to Crafting – the only thing that is “LE” on most Glory LE Fennux is the over-ride of the Fennux Coat. It’s more-or-less exactly like Crafting, except for the fact the coat will not pass. 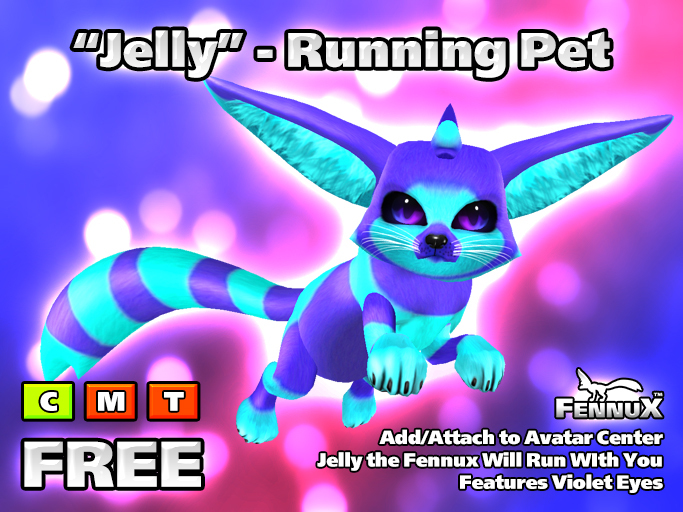 We just put this new running pet up on the SL Marketplace. A free gift that is just for fun, a re-color of the “Tango” coat. This is not a “Real Fennux”, rather an avatar attachment that you wear on “Avatar Center” (right click the object, add/wear, “Avatar Center”). But, it’s completely free! It does NOT require food or anything else to keep around, we really mean free. It’s animated to lay, sit, stand, dig, just like our other running pets we’ve released over the years. Over 16,000 people obtained our “Blue Tiger Running Pet”, which is also available on the SL Marketplace, so we decided to make another one of these to see how it goes. It’s a great way of pulling in new users to check out the actual Fennux Breedable Game. Anyway, that is all for now – just a quick update. Oh, and the rarity chart was just updated if you haven’t noticed. We’re doing a lot of other things in secrecy to better the product, just had a great meeting with Dash yesterday, so keep an eye out for more updates. The June 2015 “Clearly” Limited Edition Fennux Coat is here! And that’s all there is to it! Enjoy your Clearly LE Fennux Den, and your 12 Days of Reserve Food! WHERE DO I GET MY CLEARLY LE FENNUX? The Wishing Well exists only on the Fennux Sim. We have 1 setup next to every Crafting Machine, and of course these Wishing Wells are used to turn any 12 Fennux Dens into 1 Clearly LE Den (and 12 days of Reserve Food). Yes there is a SMALL CHANCE to get “LE Lucida Eyes”, but the odds are roughly about a 0.5% chance to obtain, so don’t expect to get them! The LE Spectrum Eyes can pass onto other coats, so even if you don’t get them from Wishing, you will have opportunities to obtain them in the Secondary Market later. Most Fennux however will have regular eyes from a starter den, very similar to Crafting – the only thing that is “LE” on most Clearly LE Fennux is the over-ride of the Fennux Coat. It’s more-or-less exactly like Crafting, except for the fact the coat will not pass.